We love Startups. 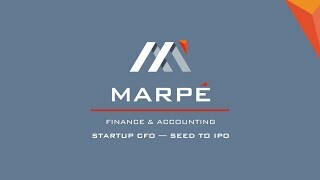 In fact, Marpé was founded to meet a specific unmet need in the market – to serve startups through the entire early growth phase, from seed to IPO. At Marpé, we provide 409A valuations quickly and painlessly. We are very diligent and careful in our work, and we will stand behind our valuations in the case of an audit. A first-time audit can be a painful experience for a privately held company. We know what auditors are looking for. We know how to put the right information in the right package, with a bow on it. M&A transactions involve high stakes and often are highly pressured and fast paced. We provide support services for M&A transactions in several ways. A bad audit can seriously jeopardize your ability to price and sell your IPO shares in a favorable market window. The entire IPO process can be derailed. We can help. Startups, as well as later stage companies going through an IPO, all have at least one thing in common – they need help with taxes. We’re there for you. We understand you want a business partner, not just an accountant. Competence – We are experienced experts in the fields of corporate accounting and finance, and we provide best-in-class service. Exceptional Value – Our quality of service, combined with our flexible pricing structure, is designed to provide exceptional value to our clients. In our market segments, we believe can provide better value than any of our competitors. And we really mean that. We're confident you'll agree. Integrity – Integrity is not optional for us. Integrity is more important to us than profits. Seriously. Relieving you of headaches is our desire. Let us take care of your finance & accounting headaches, so you can focus on something more important – your business. Outsourced accounting and finance support for start up & early stage companies – We provide part-time, outsourced finance and accounting solutions at every level from CFO to payroll processing. We offer complete finance and accounting support for all facets of business growth, including bookkeeping, accounting, tax, financial reporting, financial analysis, financial modeling, budgeting & forecasting, and customized reporting for management, investors and Boards of Directors. Audit support, IPO readiness & merger support – A first-time audit can be painful. As former auditors, we know how to remove the pain. And we have the requisite expertise and experience to support you as you grow. We provide technical accounting consulting to support you through the IPO process, including the audit and SEC review. If your exit strategy involves a merger, we bring our M&A experience to bear to assit you through the negotiations, due diligence and closing. 409A valuation – The U.S. Tax Code requires a professional valuation of private company stock and stock options in connection with grants of stock-based awards. We have business valuation expertise and experience with many private company valuations. When you engage Marpé, you will be served by experienced CPAs, MBAs, financial analysts, accountants and bookkeepers. Glenn Ballard founded Marpé in 2011 with one unwavering objective and commitment – to provide world-class accounting and finance support to startups and early-stage companies – at prices right for them. Steve Walker is one of those rare individuals who could be tremendously successful at anything he wanted to do. He could be a high powered attorney in a big law firm. He could be the CEO of a global 100 corporation. He could excel at many, many different things. He really is that smart and talented. Any CEO would be thrilled to have Steve on his or her team. Crystal Ma is Marpé’s resident global citizen. She brings to bear great breadth and depth of experience in terms of technical expertise, industry knowledge and geographical variety. In 2009, a group of MBA students at UC Berkeley created Magoosh to offer an affordable, convenient and enjoyable way to study for standardized tests. Since then, Magoosh's multimedia platform has helped thousands of customers improve their scores. The tech startup offers web and mobile applications to help students prepare for the GRE, GMAT and SAT. Customers pay a one-time, upfront fee for a SaaS subscription - typically six months of access. Proto.io is a user-friendly platform to create interactive mobile application prototypes. The concept was born from a digital design agency in Cyprus, an island country in the Eastern Mediterranean. Tech entrepreneur Alexis Piperides and his team created the Proto.io platform initially as an internal tool. The platform helped them plan mobile apps with precision and drastically improved collaboration among the engineering, design and development teams within the agency.